MinnFinn is a simple, two-part broad spectrum treatment system for all common external freshwater fish diseases. 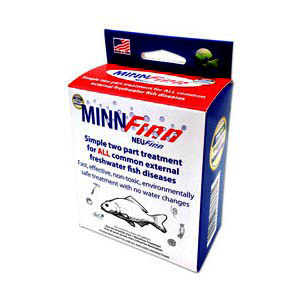 MinnFinn eliminates protozoa infections, fluke infections, and many external bacterial infections, red sores on fish and bacterial gill infections. Fast, effective, non-toxic, and environmentally friendly, MinnFinn can be used without water changes. MinnFinn can eliminate most PROTOZA infections in ONE treatment (i.e. Costia and Trichodina). Cases of ICH will require three treatments with one day between treatments. Bacterial Gill Disease was effectively treated in one treatment and Red Sores cleared up in one to two. Flukes were cleared in one to three treatments (applied as for ich) depending on the species of fluke. Are water changes needed? After neutralizing, MinnFinn does not require water changes making it very simple and safe to use. Treatment time is only 1 hour. Once neutralized with NeuFinn (included) MinnFinn breaks down into water, oxygen and carbon dioxide. No need for water changes following treatment. One box of MinnFinn Mini (50ml) treats up to 220 gallons of water when treating freshwater tropical fish, or 110 gallons of water when treating goldfish and koi. As with all disease treatments, follow instructions carefully.